Sell-out crowd, loud chants, impressive tifos, pyrotechnics and tears. And that only off the field. On it two friendly games were held to bid farewell to Gerhard-Hanappi-Stadion. Demolition will start this summer. On Sunday a capacity crowd of 17,400 people filled the stands of Gerhard-Hanappi-Stadion. Austrian home side Rapid met with Celtic to carry out the very last game before demolition. On the field a 1:1 tie was accompanied by much shorter exhibition game of Rapid legends, this one again ending without a winner, at 3:3. Even more happened in the stands. Fans in the western end covered themselves with a massive flag bearing Hanappi’s portrait and the years 1977-2014, symbolizing the opening and closing dates. The flag was signed with a slogan “Built as Weststadion, as Hanappi-Stadion a legend”. In the northern and southern side stands fans were holding up and then waving thousands of small flags, also with Hanappi’s image. 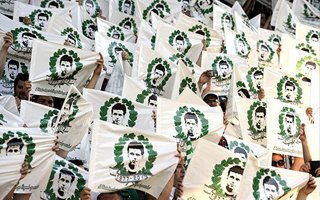 The legendary leader of Rapid, without whom the stadium wouldn’t have existed, was celebrated numerous times on Sunday. After the final whistle of Rapid-Celtic fans stood up to hear 88-year-old Alfred Koerner (oldest living Rapid player, star in 1940s and 1950s) sing the club anthem. Pyrotechnics were set off on both west and east ends. As the event came to a close, speaker asked fans not to tear any piece of equipment. Seats and other souvenirs will be available on sale, aiding the club financially ahead of their biggest project to date – construction of a brand new stadium in the very same spot. Once the demolition is over this summer, construction of the new 28,000-capacity stadium should begin.